Once in a while I tackle a blog topic and discover how little I actually know. A few months ago, I heard a radio commentator say the disabled are the largest minority in the world. I filed it away as a possible blog topic and last week decided to tackle it. People with disabilities are an invisible population; they are the world’s largest minority. That doesn’t mean we don’t see them, it means we do not acknowledge them. According to U.S. statistics,1.6 million people between the ages of 35 to 64 have a disability, making them the largest age demographic of any minority. In the United States 13 percent of the population live with some form of disability; including those who have long-term physical, mental, intellectual or sensory impairments; which limit or even prevent their full participation in society. As the population ages this figure is expected to increase. Age is a significant factor in the likelihood of having a disability. Almost half of those 75 and older and more than a quarter of those 65 to 74 are considered disabled. 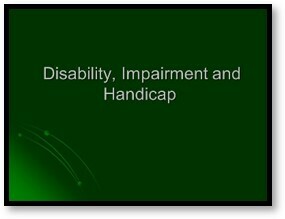 Impairment, disability and handicap are often used interchangeably, but they are not the same. However, they can all be relevant to a single condition. IMPAIRMENT is any loss or abnormality of physical, physiological or anatomical function. The impairment is the actual condition; disability is the restriction of ability caused by the condition. DISABILITY is the inability to execute movement, pick up sensory information or perform a cognitive function (as a result of impairment) that unimpaired individuals are able to perform. 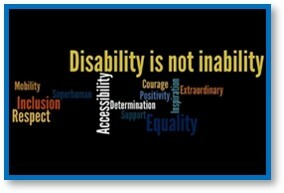 A disability may be physical, mental, cognitive, emotional, and developmental or a combination of these conditions. HANDICAP is any physical or mental defect, congenital or acquired, preventing or restricting a person’s ability to accomplish something that others are able to do. Cerebral palsy is a congenital disorder that affects movement, muscle tone, balance, and posture, making it difficult to stand or walk. The inability to move the legs at the joints and to bear weight on the feet is the impairment. The inability to walk is the disability. Cerebral palsy is the handicap, preventing normal mobility at home and in the community. Services and medical equipment can reduce the impairment but will not remove the disability or physical handicap. Let’s educate ourselves on the use of terminology. It is politically correct to say that a person has a disability and it’s impolite to call someone handicapped. Advocacy for the disabled is less than it should be, primarily because people are unaware of the depth and breadth of this community and their needs. Disability rates are higher among groups with lower educational levels. The Individuals with Disabilities Education Act (IDEA) requires that students with disabilities be educated to the maximum extent possible with students who do not have disabilities. However, some schools continue to use self-contained classrooms that restrict children from mainstream academic and extracurricular activities. They leave school under-prepared for adult life in work and social communities. Ninety per cent of children with disabilities in developing countries do not attend school at all. Eighty per cent of people with disabilities live in developing countries. The World Bank estimates that 20 per cent of the world’s poorest people have some kind of disability, and in low income countries females have higher rates than males. 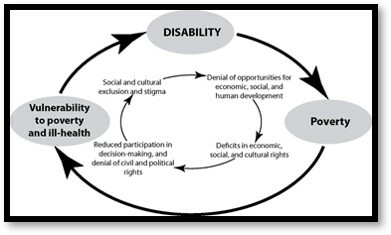 The link between poverty and disability means poor people are more at risk of acquiring a disability due to lack of nutrition, health care, sanitation, and safe living and working environments. It creates a vicious circle as people face barriers to the education, employment, and public services that help them escape poverty. The Convention on the Rights of Persons with Disabilities (CRPD) affords people with disabilities equal human rights under the law but it does not create new, special or different human rights for people with disabilities. Disability represents a form of diversity, just like gender, race, ethnicity and religion. People with disabilities are fighting for economic and social equality. According to the 2015 U.S. Census, the median earnings for disabled people were less than 70 percent of the median income for people without a disability. 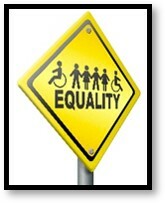 One of the ways equality fails the disabled is environmental constraints. If a building lacks an access ramp, the handicap is not the person in the wheelchair as much as it is the lack of access. The person’s mobility is disrupted by an imposed restriction in their environment, not their disability. It’s called disability discrimination and it means you are treated less well or put at a disadvantage for a reason that relates to your disability, not because of your disability. It does not have to be intentional to be unlawful. Neither is it discrimination to treat a disabled person more favorably than a non-disabled person. As children we are taught not to stare at the disabled and as adults we reflexively look away. What is it about disability that makes us so uncomfortable? One reason is limited knowledge (like me) coupled with minimal daily interactions that involve someone with a disability. We don’t know what we don’t know and not all disabilities are visible. Cultural norms, misinformation, and being uncomfortable around someone with a disability shape reactions and opinions. Disabled does not mean unable. It does mean limitations need to be accommodated, so people can work around their limitations instead of being defined by them. When we teach kids what diversity really means we break stereotypes and misconceptions and they learn the importance of acceptance and promoting change.